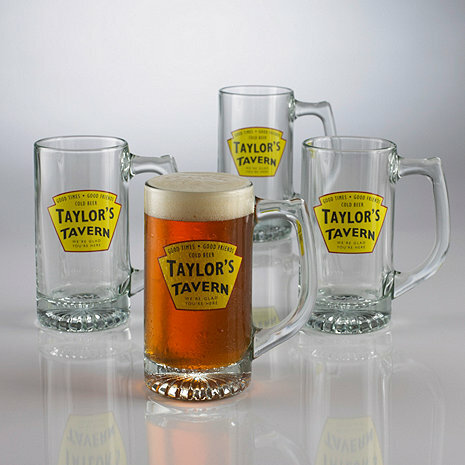 Your good name will always be associated with good brew, thanks to our personalized pint glasses with the eye-catching "Tavern" logo. Before friends enjoy a frosty serving, they'll know they're in good company with the saying "Good Times, Good Friends, Cold Beer" above your Tavern name, and "We're glad you're here" below it. Brand yourself as the ultimate beer meister! Your good name will always be associated with good brew, thanks to our personalized pint glasses with the eye-catching "Tavern" logo. Before friends enjoy a frosty serving, they'll know they're in good company with the saying "Good Times, Good Friends, Cold Beer" above your Tavern name, and "We're glad you're here" below it. Machine made of lead-free glass; decal contains some lead. Hand wash.
Personalize with name up to 14 characters, including spaces/punctuation. Font size, color, or position cannot be changed. Graphic and sayings are standard and cannot be changed or removed. "'S" (apostrophe + S) is not automatically added to personalization. "'S" is counted as 2 characters (apostrophe + S) and must be requested at time of order. Product arrived in good condition about two and a half weeks after ordering. I was expecting three to four weeks, so it was nice that it was earlier.